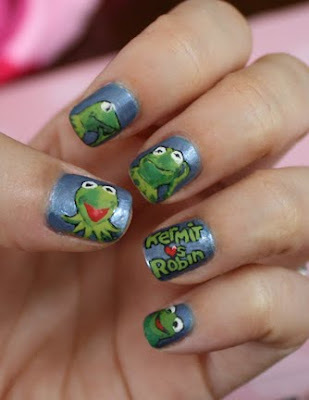 The fourth week of the OPI Mani Madness contest featured Kermit. Did you know Kermit is 56 years old? He was created with an old coat and two halves of a ping pong ball. When Kermit turned 50, he toured the globe and visited Kermit, Texas, where he crowned the Kermit High School Homecoming Queen and was the Grand Marshal of the homecoming parade! The thing that fascinates me about Kermit is how Jim Henson was able to express so many emotions, from exasperated to thrilled, with the simplest of all the Muppets. That's where I got my inspiration for the Kermie manicure. I also think the relationship between Kermit and his nephew, Robin, is so precious. I always loved to see them hang out and sing together! So, I had to include him, too. P.S. 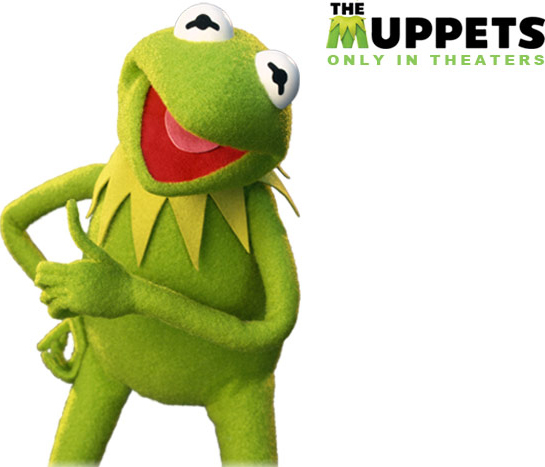 Kermie's background color is Wet n Wild Rain Check.